I believe that the ad below contains an embedded subliminal message. Such a message is transmitted via one or more artistically embedded hidden objects or images. If they exist, these messages appear framed to appeal to our baser instincts, fears and faculties. Their producers would know from testing and research that the target audience would psychologically repress them; but would hope that at least a certain percentage of viewers will, while consciously ignoring or rationalizing them, subconsciously recognize and respond to them. The controversy surrounding this type of subliminal stems from a long-running debate over the existence and nature of the subconscious; and from the fact that most of us appear to see what we expect to see, consciously ignoring things planted by an artist in such a way that s/he knows will keep them "hidden in plain sight". While we may miss such intentional plants, it is also possible to see things that aren't there. I am afraid that many subliminal hunters fall into that trap. Human history shows unequivocally that, as a species, we can infuse objects with meaning where clearly there is none. If you doubt that last sentence, think about the reasons we've named stellar constellations as we have, and the deistic explanation given to astronomical phenomena by earlier civilizations. Barring a confession by the artist who created the image in the ad below, there is probably no way to know with certainty if it contains a subliminal embed. You need to ask yourself if the image shows evidence of artistic tampering, and, if so, then whether such tampering can be fairly interpreted in the way I have done below. Review the ad, then think about the answers I've provided to the questions beneath it. If you disagree with my answers, try to determine what you see that I don't; or vice versa. At whom is it targeted? Is it commercial or non-commercial? In one clear, brief sentence, summarize the message with which you've decided to work. Calm your fears with Crown Royal Whiskey. Are there other propagandistic messages in this item? Is the author attempting to elicit a behavior or a belief? Clearly state the behavior or belief the author wants from the target. S/he wants you to buy Crown Royal Whiskey. Does the message attempt to manipulate with emotion, reason or both? Describe how you think the manipulation works? Research appears to show that the majority of alcoholic beverages are sold to heavy drinkers, people who could objectively be diagnosed as alcoholic. In addition to suppressing withdrawal symptoms, alcoholics probably drink to escape problems and fears in their lives. If actually present, the embeds in this ad seem to represent images that might awaken one from a dream in a panic or a cold sweat. They also seem to play off of the conscious destruction theme represented by the breaking bottle. Seen subconsciously by a person who drinks alcohol to escape fear, these embeds might trigger a desire to drink. Associated with this product, they might trigger a desire to purchase Crown Royal Whiskey when a subconscious fear asserts itself. What in the world are they doing there? Maybe they really aren't. To the casual observer, they might appear to be just whiskey from the broken bottle, puddling and splashing immediately after the bottle's impact. That would surely be enough to make an alcoholic cry - all that lost drink. It might even be enough to make a non-alcoholic purchaser cry - all that wasted money. But if they are embeds, they could serve as a subconscious reminder to an alcoholic of what s/he faces if that next drink is postponed - the DTs (delirium tremens, the shakes and hallucinations that characterize alcohol withdrawal). The message to a drinker's subconscious might be, drink or face this. Wouldn't that be just enough to "make a grown man cry?" 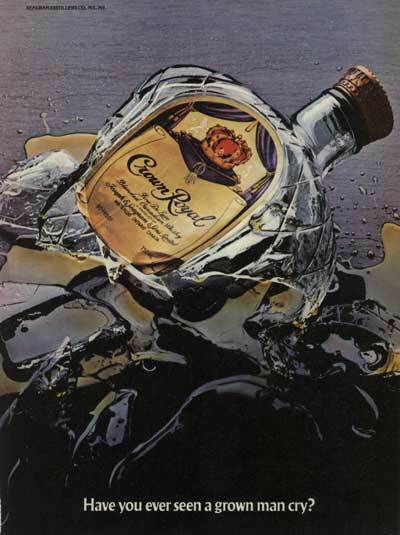 It is also important to note that, while this ad appears based on the photograph of a bottle breaking, upon closer inspection it reveals itself to be a photo-realistic painting. Nothing in it was captured with a camera at the moment a bottle of Crown Royal hit the floor. It is entirely an artistic creation. Do you believe this item was successful propaganda? What evidence supports your answer to the last question? I repeatedly saw this ad in national magazines from the mid 1970s through the mid 1980s. I can recall no other ad running for such a lengthy period. This unprecedented longevity is a testament to its power and effectiveness. copyright © 2002-2004 classroomtools.com. All Rights Reserved.